Heat a wok or large frying pan until smokin ghot. 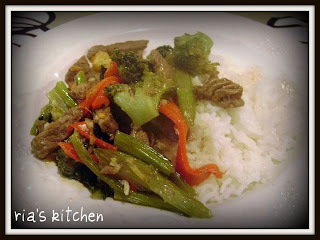 Add 1 tbs vegetable oil and cook beef stir fry strips in batches until cooked through and browned, set aside. Add 1 tbs oil to wok and cook 2 cloves of garlic and ginger until fragrant. Add celery, broccoli, capsicum, baby corn, oyster sauce, sweet chillie sauce and choy sum. 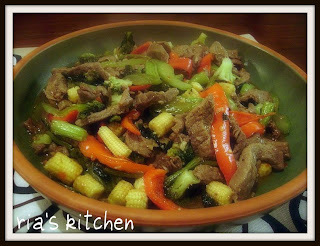 Stir fry until softened. Add meat. 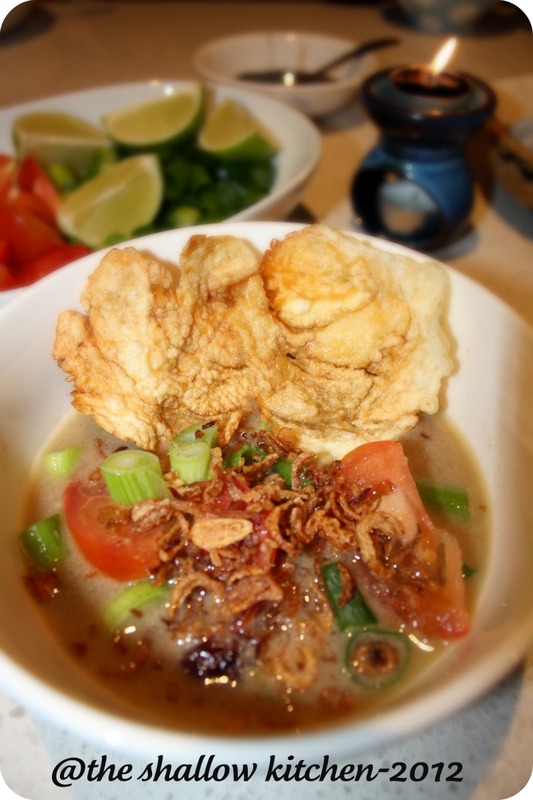 Heat through and serve with rice or noodles and garnish with spring onions. Another winter meal…. 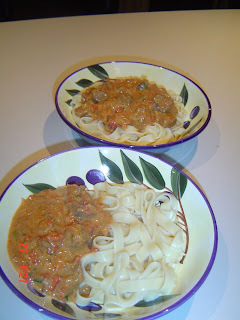 this recipe originally I got it from my friend Dianti, thanks yea Di! Mix the corn flour with a bit of water until it form paste. Add all the sauces. Put aside. Cut the tofu about 1cm thick, dunk it once in the flour, then fry with oil until both side very light brown color. Put aside in the bowl. Fry garlic and minced meat, add all the sauces, add water if the mixture is too thick, then add the coriander, cook it for about 10 minutes. Add all the mixture to the tofu, stir them altogether. Serve with a steamed rice. 1. preheat the oven to 150 degree Celsius. season the flour and use to coat the beef. heat the oil and butter in a heavy-based, flameproof casserole until the butter has melted. 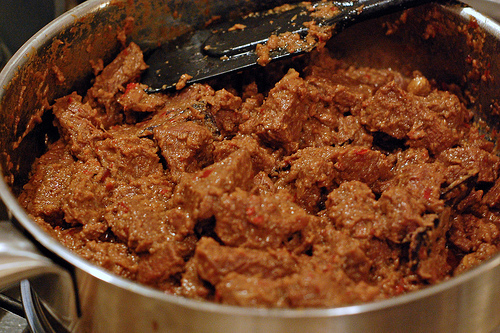 fry the beef in batches until the outside is sealed and browned. 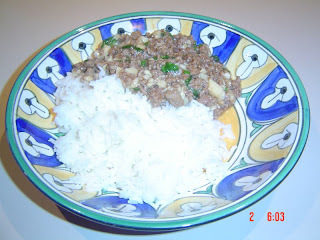 use a slotted spoon to remove the beef to a plate and set aside. 2. return the casserole to the heat and fry the onions gently for 4-5 minutes or until golden brown. add the red peppers and continue to cook for 5 minutes. stir in the paprika, cook for 1 minute, then pour in the stock. 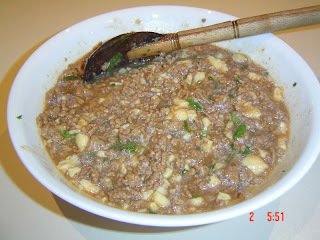 3. return the beef to the casserole, stir to combine all ingredients and bring to the boil. cover and cook in the oven for 1.5 hours or until the beef is tender. 4. remove from the oven, check the seasoning and skim any fat from the surface. stir in the soured cream. 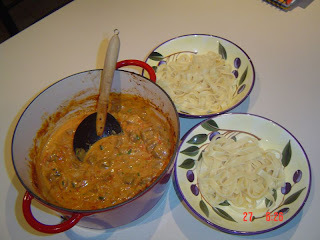 serve with tagliatelle/fettuccine and garnish with snipped chives. Cook’s tip: this stew can be made 1-2 days in advance as this improves the flavour. chill in the fridge after step 3. reheat on the hob for about 15-20 minutes or until the goulash is piping hot. 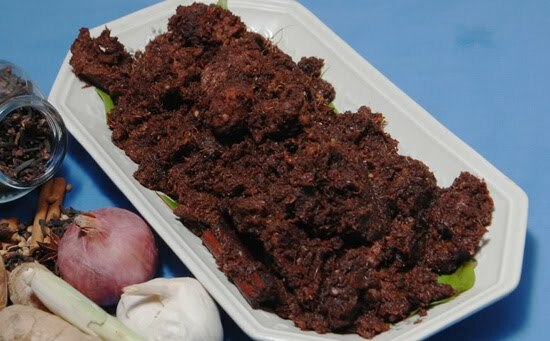 this recipe i got it from my friend’s mother in law, it’s very easy to make and taste as original as the real rendang only this one is far less complicated and very quick. blend altogether shallots, garlic, chillies, and ginger until smooth like a paste. add 2 tbsp oil and fry the paste for about 3 minutes. add the beef, kafir lime leaves, and lemongrass and cover for about 5 minutes, then add the coconut cream, salt and pepper. stir and cover for about another 5 minutes or until the coconut a bit thick and boiled then add little by little the dessicated coconut, and stir. Cover about 15 minutes, stir, and cook until the meat is tender. Stirring occasionally. cut eggplants into 2. fry or grill in the oven until its tender both sides. meanwhile, blend chillies, shallots, tomato,shrimp paste until smooth. add a bit oil and fry until it boils and the mixture not too runny, add the eggplant, stir. serve with steam rice. Fry or grill chicken until brown. Put aside. Fry the spices (shallots, garlics, etc) with oil, add the chicken, add coconut milk and half cup of water, lemongrass, kafir lime leaves, stirring occasionally. Cook with the lid on until chicken is tender. Serve with fried onion. note: this meal is good to eat with the chili eggplant, serve with rice.